Front Porch: A Forum for Fighting? 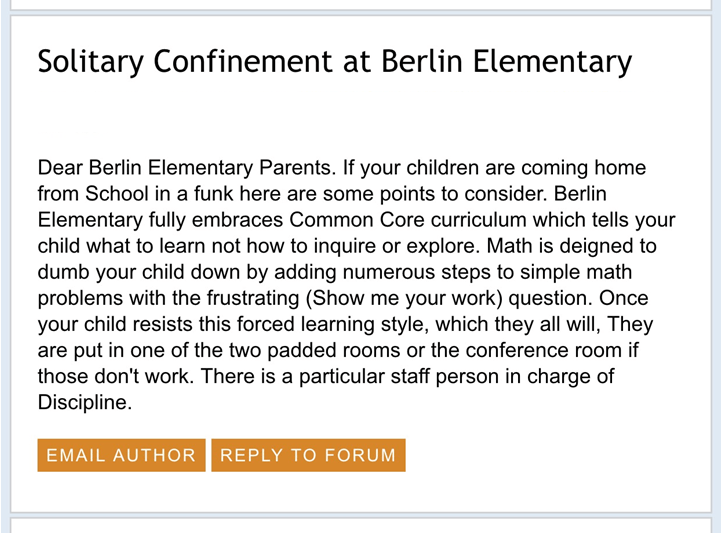 Recently, there have been posts and comments relating to student discipline and learning at Berlin Elementary School; that students are being forced to learn in a certain way, and if they don’t comply, they’re sent to “solitary confinement.” Some parents are not happy, and they are using Front Porch Forum as a way to express their anger. One parent’s comments capture the tone of the discussion. One potential problem with platforms such as Front Porch Forum is that users have a way to voice their opinion without saying it face to face, which could result in posting things that are particularly disagreeable. 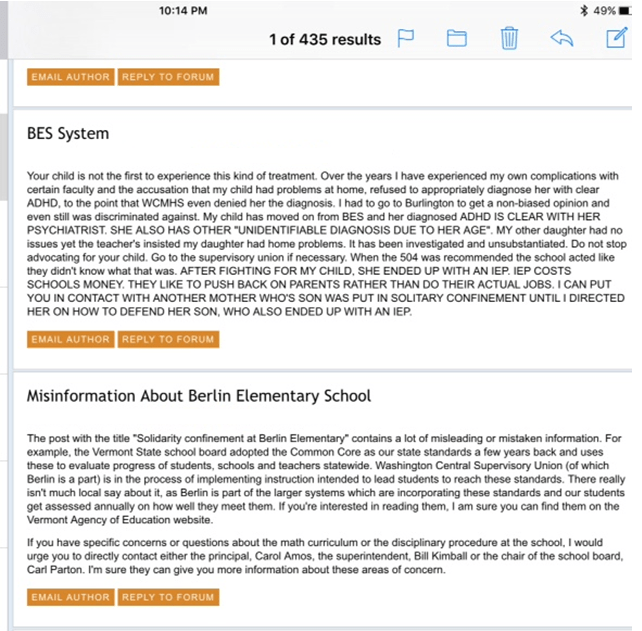 The anonymity of the site, and the fact that it is generally easier to voice opinions over a computer than face to face, could be reasons why some parents are posting angry comments about their child’s school. Front Porch Forum is meant to resemble a town meeting, where all community members have the right to talk about issues that are important to them, but a key part of all town meetings is a facilitator to keep things under control. Although there are moderators on Front Porch Forum, it seems some users are typing things that they wouldn’t otherwise say. Said Wood-Lewis, “While it’s not rocket science, it’s also not terribly obvious how to do this well. Most of the days we do a pretty good job, but we still take our lumps and we’re still learning”. Front Porch Forum is indeed moderated, and postings are NOT anonymous. Regardless, each FPF is a partial reflection of its local community. While 99% of FPF postings are not in the least controversial, a tiny portion of them do address challenging subjects like school issues, taxes, pet-owner behavior, etc. But, rather than silence these voices, FPF provides a platform for Vermonters to share their views and concerns with their neighbors in a non-anonymous way. We do not permit personal attacks. It’s not alway easy to live in community with our neighbors and we encourage civil and neighborly use of FPF. Front Porch Forum is indeed a work in progress. Best wishes. P.S. The final quote in your article is missing proper context. I was not interviewed for this article, rather, that’s a quote from a recent VPR interview.